In a series of appearances beginning in December of 1531 to Juan Diego, an Indian neophyte, the Virgin expressed her desire to have a church built upon the site of her appearance, the Tepeyca hill, just outside the Mexican capital. The Virgin’s wishes were granted once Diego presented a cloak full of roses to the unbelieving bishop. The cloak, or tilma, miraculously presented her image. 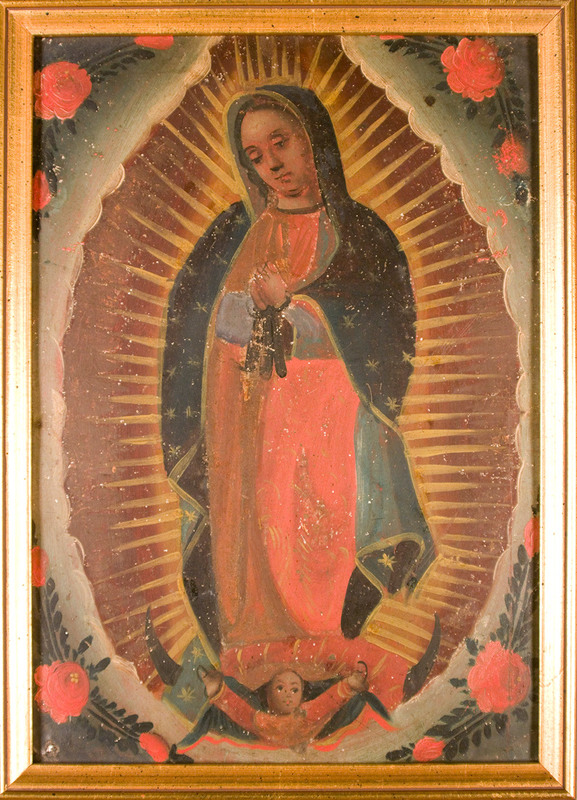 This tilma is still found today in the basilica of Guadalupe, and has been there since 1709. Our Lady of Guadalupe, surrounded by a mandorla of golden rays, is standing on a crescent moon, supported by a cherub. This depiction of the Madonna, standing on the moon and encircled by a large halo, was built upon medieval illustrations of the Apocalyptic Woman, which can be traced back as early as the tenth and eleventh centuries. Her appearance to Juan Diego was an important element of the conversion of the Indians. Previous to the miraculous appearance, there stood on Tepeyac hill a temple to the goddess, Tonantzin, “Mother of the People, Our Mother”, also known as Teotonantzin, “Mother of the Gods”. With hopes the Indians would stop worshipping the pagan goddess, a statue of the Virgin Mary was placed in the Indian shrine. Attendance to the altered site was slight. Then came the miraculous appearance of the Virgin, with her dark complexion and compassion for the poor and humble. Her blue mantle with golden stars reflected the garb of the Mexican heaven, not unlike Tonantzin.